The measure of a vacation rests in the long lasting impressions which linger long after you set foot back onto the familiar turf of home. Maui will ever be etched into my subconscious for all of the "firsts" she bestowed upon me. My first helicopter ride, the first time I have ever seen a rainbow touch the ground, the first time I have seen a bathtub with a fill spout in the ceiling, my first black sand beach, the first time I have sat on the beach beside cows grazing on a verdant pasture, the first time I have peered down at the cinder cones inside a volcano, my first tasting of a lillipot fruit, my first glimpse of a green sea turtle, my first, and probably only, encounter with a hitchhiker named "Universal Eternity Live Well Be Free". The villas we saw in Maui were unlike any I have seen anywhere else. They were spacious, if not outright huge! Part of the illusion of grandeur emanated from the high ceilings, many of which were accented with a tray inset featuring either a fan or the glow of recessed lighting. These towering tray ceilings served to further define the rooms within the open floor plan that seemed to be hallmark of the current Maui design trend (big, bold, beautiful, top quality materials). Most villas featured generously sized bedrooms whose beds were adorned with lovely handmade bedspreads and stacked high with pillows. You could just imagine the sensation of slipping your clean sun soaked body between the cool soft sheets to melt into a satisfied slumber at days end. Just about every bathroom featured some kind of fabulous soaking tub, Jacuzzi tub, or shower stall armed with an arsenal of spray jets and rain head shower fixtures. Water is not at a premium in Maui, and her bathrooms attest to that. Some of the tubs take almost an hour to fill. The kitchens are another focal point of almost every house. Magnificent marble and granite countertops set on to fine koa wood cabinetry anchor kitchens that truly take center stage in wide open living spaces. When we asked our private chef Jana (whose spirit was as delightful as her food) which kitchen she liked cooking in best of all the villas, she honestly couldn't answer. She did note that she loved the hint of blue iridescence, reminiscent of blue morpho butterfly wings, which shimmered at certain angles from the marble counter tops at Villa HHI ABS where we were dining that night. Maui is a lush, well watered, fertile island...in some parts... and a stark parched moonscape in others. It just depends which side of the car you are looking out of! 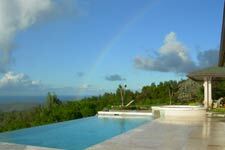 I was astounded, confused and mesmerized by this phenomenon constantly as we drove around the island. Some of the nicest beaches do not lie in the shadows of high rise resorts or condos. Surprisingly, they hug the shore of the roads connecting the major towns. At first I found this odd – seeing arriving waves. On a calm day, the waves seem to pop up out of nowhere, almost random in their formation. I am beginning to understand why surfers in Maui always seem to be scoping out the beaches and the waves, as the surf seems to change at whim and you need to be ready to seize the moment when it presents itself. 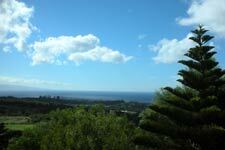 This wonderful unpredictability is the twinkle in the eye of Maui. Like the sudden arrival of a soft rain shower amidst brilliant sunshine, or the thread of a waterfall cascading through ancient foliage, or the eye of a burgundy colored octopus peering at you from beneath a coral covered lava rock, or the end of a rainbow kissing the ground in front of you, but disappearing as you reach out to touch it's indigo stripe. There is something fleeting but everlasting about these magical moments in time in Maui. Maui's history doesn't seem to be captured in its bricks & mortar, or caged in museum halls. It is in the air, whispered in the rains, fed up through the roots of its ancient trees, dancing in the shadows of the clouds as they linger along the crater edge or cascading down the emerald ravines of the West Maui Mountains, and in the sapphire blue waves rising up to burst white upon monumental craggy black lava rocks. No matter how much man has infiltrated with his roads and buildings, commerce, signage and exhaust, the ancient gods seem to have empowered these natural elements to maintain dominion. 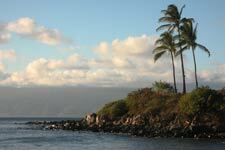 There is intriguing Maui history, folklore and spirituality that awaits discovery. It is hinted at commercially through the Luau celebrations and more modern interpretations such as the Ulelana performance in Lahaina. And then there were the missionaries, and the plantation era with all of the influences that pumped through the veins of those times to fuel the culture and relationship with the land. Add to this the eastern religious and cultural influences of the Chinese workers who labored to build the irrigation systems down the treacherous mountainsides to sustain the sugar cane and pineapple plantations in the flats below. On the last leg of our helicopter tour we cast our tiny helicopter shadow over square miles of waving green sugar cane and over the meticulously edged, rigid purple & green spikes of the pineapple fields. The fertility of this volcanic island, fed by abundant rain, irrigation and sun allows Maui to produce so much of it own special quality food. Persimmons and avocados were dripping from trees up in Kula while we were there and our chef Jana prepared fresh persimmon capriccio topped with a thin slice of parmesan as one of our in villa dinner hors d'oeuvres. Restaurants such as Merrimans, IO, and Pacific O have their own farms providing fresh produce, herbs and specialty items for their menus. Even at the Ritz Carlton, the scent of sun warmed basil and rosemary fills the air as you stroll by its new poolside herb garden. All of these fresh local fruits and vegetables and fish, along with the locally produced Surfing Goat Cheese, grass fed Maui beef and the wild boar, coupled with their pride in their nurturing and preparation makes for some great dining in Maui. You will find this wonderful freshness in the small village eateries as well as in the best restaurants throughout the island.